In Norse mythology, Bifröst is the bridge between the land of mortals, Midgard, and the land of the gods, Asgard. The gods cross it every day to meet and decide things at Urdarbrunn (Well of Urd) under the tree Yggdrasill. The bridge is a rainbow. It was built by the Æsir and is guarded by the god Heimdall. 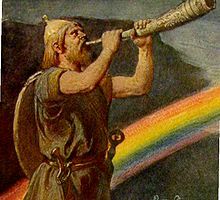 Only the thunder god Thor was not allowed to use the rainbow, because he may break it. The bridge will be destroyed at the end of the world, Ragnarök, when the relentless army of giants and the dead run on it to attack Asgard. Alternative names: Bilröst, Ásbrú, Bifrost. This page was last changed on 19 June 2017, at 17:10.